The writer and critic Terry Castle–described by the late Susan Sontag as “the most expressive, most enlightening literary critic at large today”- has taught at Stanford University since 1983. Her scholarly interests include eighteenth-century British fiction, the Gothic novel, Jane Austen, the First World War, English art and culture of the 1920s and 1930s, autobiography and biography, and gay and lesbian writing. She has published eight books on diverse subjects, including Masquerade and Civilization (1986), The Apparitional Lesbian (1993), and the prize-winning collection, The Literature of Lesbianism: A Historical Anthology from Ariosto to Stonewall (2003). 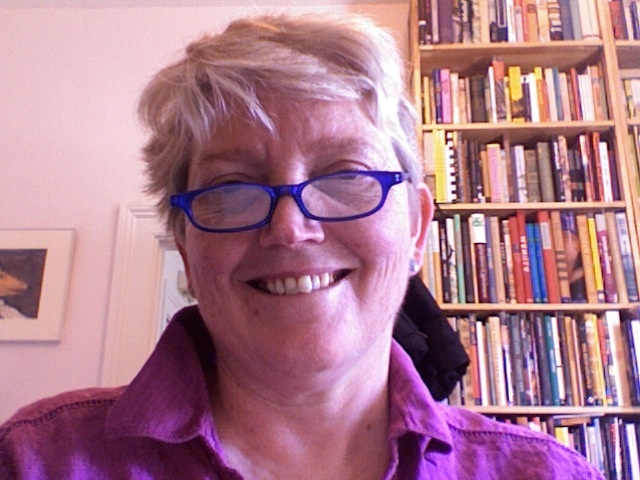 She is also a well-known essayist and has written frequently for the London Review of Books, Atlantic, New Republic, Times Literary Supplement, New York Times Book Review, and other periodicals. Her latest book, The Professor and Other Writings was published by Harper Collins in January 2010 and will be out in paperback in January 2011. In 1997 she was named Walter A. Haas Professor in the Humanities at Stanford. In her spare time, Castle is a visual artist, music and book collector, and miniature dachshund enthusiast. She lives in San Francisco. Terry Castle: Well, I can only answer with a metaphor: think of all those circles of punishment in Dante’s Purgatorio. I’ve been writing for at least 600 years, I would say, carrying great boulders around on my back. And that’s only this month! On bad days, of course, it feels even worse. 2000 years just doing the boulders; then 2000 more years having feet held to fire,being submerged in filth, etc. TC: No, I don’t. (It only seems that way.) Or perhaps I should say I haven’t for a long while. Teaching makes it impossible. Having a life makes it impossible. But that said, in my more productive periods, when I have a sabbatical or fellowship or something, I do try to write at least half of the day, every weekday. I’ve always taken most weekends off–I’ve tried to follow a more or less manageable working man’s schedule, I guess. Over the past few years, for better or for worse, I’ve found myself doing visual art more and more–my writing now has to compete with that too. NS: What are your feelings on “writing on writing”? Ever read the advice other authors give? TC: I confess, I don’t think I’ve ever read much in the way of ‘writing on writing.’ Not quite sure what the category is, but it sounds bad. Gassy and girlish and fake-inspirational. Do you mean some sort of self-help book? Sitting by a little babbling brook, nurturing one’s precious writerly thoughts, keeping a ‘dream-journal,’ musing about kitty cats, etc.? Now that I think more about it, however, there are certain classics I’ve encountered along the way that one might describe as ‘writing on writing’: Gertrude Stein‘s tongue-in-cheek little primers on ‘How to Write,’ for example. Wordsworth‘s Preface to the Lyrical Ballads… (Still thrilling.) Kingsley Amis’s The King’s English; Woolf‘s essays dealing with women and writing, and so on. And to respond more seriously on the ‘advice’ part of the question: I suppose the primary way I get such writerly ‘advice’, and have always gotten it–if only indirectly–is by reading other writers’ letters and journals. This sort of snoopy reading is an extreme passion of mine. In both letters or journals, one can see up close how writers go about things, from day to day. What the discipline and the ardor are like. Fascinating people in this regard: Byron, Flaubert, Henry James, Woolf (again), Sylvia Townsend Warner, Philip Larkin, Elizabeth Bishop. NS: Do you consider yourself an “essayist,” a “nonfiction writer,” simply an artist? TC: ‘Essayist’ is probably the most comfortable term for me. In my professional and academic incarnation, I teach the great age of the English essay–the 18th century–so perhaps it’s no surprise I find the form tremendously congenial. The freedom of it. The exploratory dimension. The unpretentiousness. The lack of specialized jargon. The wittiness. Samuel Johnson’s Rambler and Idler essays rock. Ditto William Hazlitt’s superb essays–from the beginning of the 19th century. As for the ‘artist’ part (! ): Kandinsky, De Kooning, Warhol, Agnes Martin–these were artists. Jasper Johns, Joan Mitchell, Kara Walker–these are artists. I am just a watch-ya-may-call-it —a hobbyist, a ‘Sunday painter,’ a sad case of Photoshop addiction, or something like that. NS: Apparently, more and more, we’re talking about what categorization of writing does to the reading of certain works. Do these conventions affect you in your writing or reading? TC: How genres work–what distinguishes one from another–primarily matters to me as an intellectual topic, in my teaching life, as part of a larger historical inquiry. What made the early English novel, for example, formally and thematically different from, say, Renaissance romances? I can’t help sounding professorial and pointy-headed here—but such literary-historical questions have always interested me. I confess that I detest the term ‘creative non-fiction.’ The word, the concept, seems to have migrated, like a bedbug, from the administrative world of college Creative Writing Programs into general usage. Besides the fact that it doesn’t make sense, the phrase makes any writing it purports to describe sound silly and banal. You wouldn’t say, for example–or not unless you were a pompous idiot– “Oh, yes, Montaigne wrote ‘creative non-fiction. '” Or Lionel Trilling. Or Hannah Arendt. Or Susan Sontag. Please, everybody–let’s play for higher stakes and just do what it is we do. And let’s get rid of the dumb term ‘public intellectual’ too. NS: I know that much of your work is titled in ways that lets readers know you sexual preference immediately. Was this a conscious choice, or did publishers talk you into it? Has it helped or hindered your writing or publicity in any unexpected ways? TC: My sexual preference? You impertinent creature!! I don’t know WHAT you’re talking about… Ooops, yes, I do know: I take it all back. Seriously, the question is a bit amorphous-sounding to me. I’ve written and edited books with ‘lesbian’ in the title (The Apparitional Lesbian, The Literature of Lesbianism)–but do such titles say anything about my own sexual preference? Or are you suggesting that gay-or-lesbian subject = gay-or-lesbian author ? (You may well be right.) Granted, in any case, anyone who looked into any of my writing of the past two decades would, I suspect, figure things out fairly speedily… Not least of all, perhaps, because most of my books have had gushy dedications to various ladies of my acquaintance–not just Mysterious People With Initials. I think you may be asking something more general, though, about broader links between my writing and my sexuality. I guess I see all of the writing I’ve done–beginning even with the purportedly ‘academic’ essays I wrote as a Ph.D. student in graduate school– as having had, if not some explicit declaration, at least an autobiographical subtext. I gradually became more open about my lesbianism, even as my writing itself became less ‘academic’ and more directly autobiographical. I was lucky enough to begin writing precisely at that moment in the twentieth century when, thrillingly, it was becoming more and more possible to be ‘out’ in print. My career would have been quite different, I imagine, had I started out, say, in the 1940s or 1950s. Many really wondrous women writers of that era–Janet Flanner, Patricia Highsmith, Elizabeth Bishop, Marguerite Yourcenar–did not feel free to write publicly about their lesbianism. And so they didn’t. Indeed, speaking frankly, I feel that in many ways my sexuality has worked in my favor–professionally, that is. I have never felt ‘hindered’ by it. In fact, quite the opposite: over the past 15 or 20 years it has become downright fashionable to be a homosexual in big American university English departments –viz. the ‘queer studies’ fad of the 1990s. One is seen as being ‘exciting’ and ‘hip’ and ‘cutting-edge’, even if you wear clodhoppers and never brush your teeth. NS: One of the most impressive things about your work is that you are not afraid to put yourself into it. Even when a piece is not directly about your life, your voice is heard loud and clear through your diction. Have you been criticized for this? Like I said, I’m impressed, and wish that academia encouraged this type of expression more from those who can pull it off. TC: Very hard to narrow down–a lot of my reading lately has been miscellaneous–online or in magazines. I read a lot about contemporary art and art history. I loved Lyle Rexer’s book about Outsider Art, and the recent humungous catalog of Henry Darger‘s work. I adore Dave Hickey. I confess, I don’t read a huge amount of contemporary fiction–not usually American at least. Colm Toibin is a favorite. I want to read the new book by K.M. Soehnlein. His first novel, The World of Normal Boys, was masterful. Some cross-genre favorites of the last year or so—the Sontag diaries from the 1950s (Reborn); Blake Bailey’s biography of John Cheever; Tim Lawrence, Hold On to Your Dreams: Arthur Russell and the Downtown Music Scene, 1973-1992; Felix Feneon, Novels in Three Lines (in the wonderful New York Review of Books Classics series). Pretty eccentric, to say the least. But thanks for asking.